WHAT IS LEGACY DATA ? 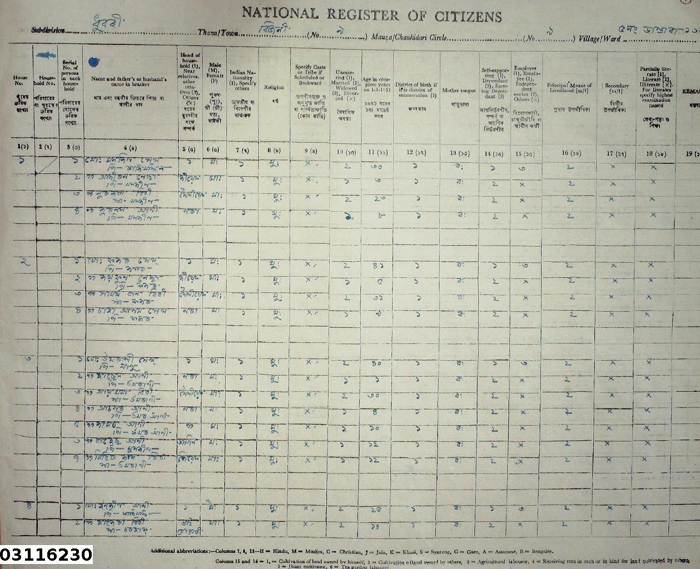 The documents namely 1951 NRC (National Register of Citizens) and Electoral Rolls upto midnight of 24th March, 1971 are collectively called as the Legacy Data. 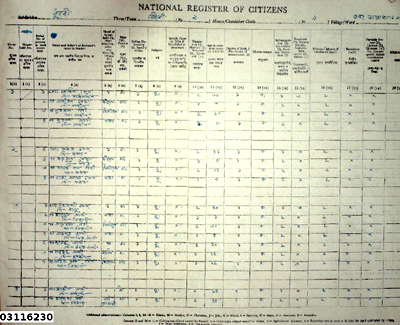 Sample of 1951 NRC, Dhubri Dist. 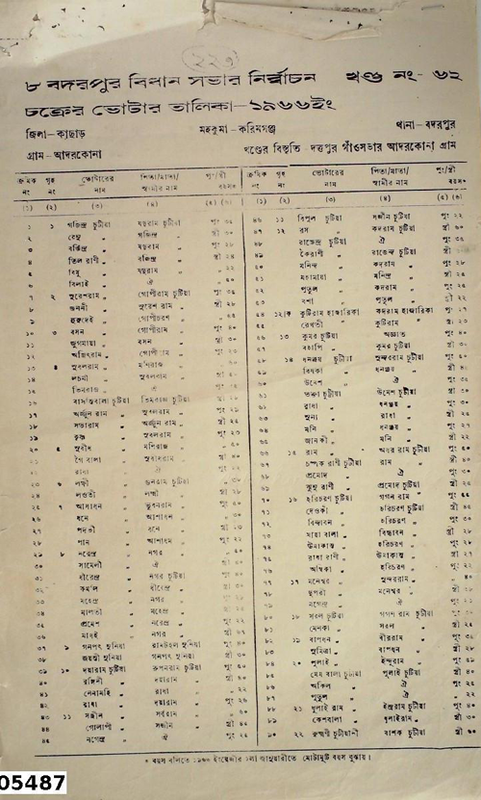 Sample of 1966 Electoral Role, Karimganj Dist. » Legacy Data document is the database of that period which would be carrying the names of a very large number of persons together, admissible to prove the claim for inclusion in NRC updated for the state of Assam. One has to adduce the proof of residence in Assam of himself/herself or his/her ancestors prior to midnight of 24th March, 1971 for inclusion in NRC. As such the probability of finding one’s name or that of the ancestors would be very high here. This would be the most commonly used document. Where can I find a copy of the Legacy Data? AT THE NSKs -- through computerized search or manual search. Each NSK shall have the segregated hard copies of Legacy Data for the villages falling under the respective Kendra. Also one can check the legacy data of any village in through the computerized search. All THE NOTIFIED POLLING STATIONS: Legacy Data has been published as hard copies in all the Polling Stations segregated for the villages falling under the respective Polling Station. NRC WEBSITE: The Legacy Data is available online at the NRC Assam web-site www.nrcassam.nic.in Under NRC HIGHLIGHTS section in the home page you will find the option of Legacy Data Search. You can also take print out of the Legacy Data copy from the web-site. Click here for Manual of Legacy Data Search. How to establish linkage with the name appearing in Legacy Data? In order to prove linkage with parent or ancestor, any legally acceptable document which establishes the relationship in clear terms between (1) the member of the family, and (2) the name of person whose name appears Legacy Data or any of the admissible documents issued upto midnight of 24th March, 1971 shall be acceptable. Such documents should be verifiable with the originals available with the issuing authority. It may be noted that these relationship/linkage documents can be issued before or after 24th March (midnight), 1971. Circle Officer/GP Secretary Certificate in respect of married women migrating after marriage is only optional and not mandatory. Married women can also use other valid documents to prove linkage. How to establish linkage in Legacy Data by married woman? Just like men, any woman shall also have to prove linkage with her father or mother or grandfather or grandmother as the case may be. As married woman are more usually referred to through their husbands, it is clarified that for establishing eligibility for inclusion in updated NRC, they shall have to prove linkage with her father or mother or grandfather or grandmother as the case may be and linkage with husbands or in-laws shall not be counted. What happens in case the name is not found in the Legacy Data? In this regard it is hereby made clear that the computerized Legacy Data search engine is just a tool to facilitate easy search, and by no means the only resort for finding proof of eligibility in updated NRC. The Legacy Database are old and even some are found in faded, torn condition, for which 100% digitization of all records may not have been possible. As such if someone’s name is not found in the computerized search the person can still look up for such records in the published copies made available at the NRC Seva Kendras (NSKs). Even if one does not find his or her name in the published documents, application can still be made for inclusion in NRC by providing any of the other admissible documents issued upto midnight of 24th March, 1971 namely, (i) Land & Tenancy records (ii) Citizenship Certificate (iii) Permanent Residential Certificate (iv) Refugee Registration Certificate (v) Passport (vi) LIC Policy (vii) Govt. issued License/Certificate (viii) Govt. Service/ Employment Certificate (ix) Bank/Post Office Accounts (x) Birth Certificate (xi) Board/University Educational Certificate (xii) Court Records/ Processes. Is it required to find entry in all Legacy Data records, which are in NRC 1951, in all the Electoral Rolls up to 1971 or in all other admissible documents? Not required. Any one of the documents will suffice. A citizen shall be required to submit record of himself or his ancestors in any of the documents admissible for inclusion in the updated NRC. It can be either 1951 NRC, any one of the Electoral Rolls upto 1971 or any one of the other admissible documents. What happens in case the name of the person is wrongly recorded in the Legacy Data? Even if anyone's name, age etc. is wrongly recorded in NRC 1951 or any of the Electoral Rolls upto 1971, there would be ample scope for citizens to prove their linkage with the correct person during field verification. Affidavits if submitted will be received but corrections mentioned there in would be effected only after satisfactory verification of its particulars by verifying officials. Designed by Trans Technologies Solution Pvt. Ltd.